The mythology story of this historic monument goes like this, Some 5000 years ago when Lord Ram along with brother Laxman was looking out for his wife Sita captured by Ravana during 14 years Vanvasa period, they came across this South Mumbai’s location. Being tired and thirsty he asked brother Laxman to get some clean water to drink, the power of weapons as shown in Mythological serials in television seems to be true when Laxman got his spiritual weapon Arrow and shot on the location where currently Bangaga tank their. 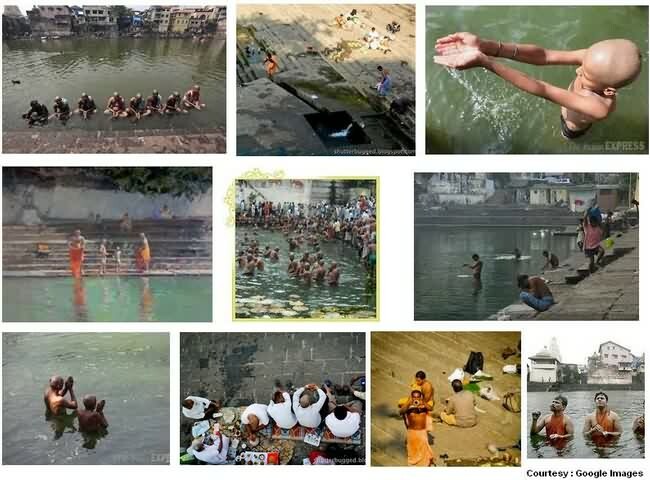 The spiritual powers of Satyuga somehow created a spring which is said to be a sub-let of Holy and Sacred River Ganga located at Varanasi in North India. It gave a clean fresh drinkable water and since then the name ‘Ban’ which means ‘Arrow’ and ‘Ganga’ which means a Sub-Let of River. Hindu’s since ancient time respected the gift by lord Ram and then in 1127 AD the tank was built by one Mr Laxman Prabhu and then again in 1715 it was rebuilt by Mr Rama Kamath who was related to Walkeshwar temple where this tank is situated. Another story of getting this sacred tank is the general visit of Lord Rama in the location and locals requested him to get some holy water for bath and other rituals to be performed to Lord Shiva for its Shiva Lingam, Lord Rama himself shot a arrow and the request was heard by Holy Ganga River who seemed to blessed locals since then with the holy water spring which is still inside, But kept closed in fear of getting blocked due to garbage and filth inside. Since then, During ritual days like ‘Pitru Paksha’, Antyesti a spiritual and ritual final rites process to immerse the ashes of deceased in any Hindu family. 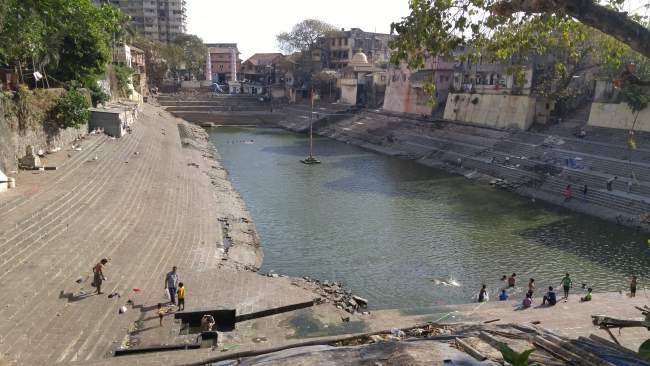 And now banganga is managed and taken care by GSB (Goud Saraswat Brahmins).People before couple of decades who did final rites at Banganga tank still has strong belief about the spiritual powers of this sacred tank. With hardly any water filled and is mostly empty and dry, as authorities fear of Accidents, Drowning and Suicide cases may happen. Local people are seen washing clothes, holy dip without soap is allowed but people take soap baths now, also washes shoes and other footwear in this tank, Clothes are seen kept for drying after wash at foot steps and surroundings. Local drinkers and smokers are seen drinking on footsteps and throwing whisky and beer bottles inside tank and garbage are seen floating on water surface of this tank. Ducks, Swans and Pigeons are seen around Banganga tank as its an idol and natural location for them. Few years before when things were still better, many locals and children use to take dip and use to swim around the tank which is allowed, but now its a shameful view as described. The holy tank stairs are all broken which makes the process of doing rituals and final rites really tough. Many times people got hurts and also falls down due to moss accumulations on the surface and surround of footsteps. Private Organization and NGO’s like Bafna Foundation along with GSB group recently done a tank clean-up activity with an astonishing results. The debris deep inside was full of wafers and biscuit packets, broken pots, plastic bottles, liquor bottles (Beer & Whisky), Other garbage, artificial dental tooth, filth, vehicle tyres, and lots of sludge and debris. 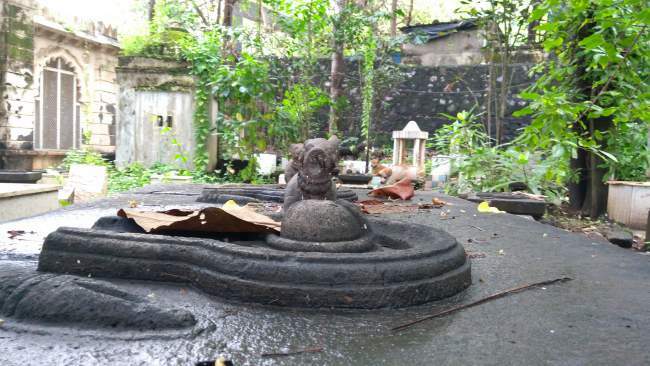 Upon clean-up process they also found some of the old idols of Hindi gods and goddess which can be preserved as valuable historic, same were / will be given to Archaeological Department for further check. Cleaners appointed by GSB trust who manages this sacred tank cleans the footsteps everyday and the water once during Pitru Paksha ritual day. For the first time i personally feel ashamed of writing about all this to my local and international blog readers that people around sometimes has no civic sense and respect towards such a spiritual heritage monuments like banganga where their own ashes can go in future. Also cannot believe that our authorities who feel and fear of accidents and such cases are ignoring this Grade ‘A’ heritage site even after talks and meetings for betterment and restoration of this lake. How will people trust and why will tourist spend so much money coming to such places getting totally disappointed. 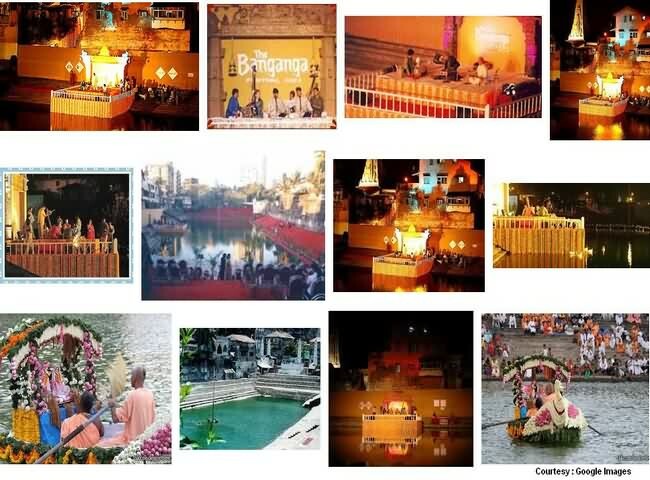 Where we find all the situations as described above, The ‘Banganga Festival’ which is an annual 2 days musical event started in 1992 organized by MTDC (Maharashtra Tourism) and Indian Heritage Society, is a tribute and awareness musical program generally on January of every year. This motive of this festival is to give tribute to the blessing of Lord Rama along with Ganga river and also to create awareness on valuing the Heritage and Monuments. Since its a musical event and tribute, most of the songs performed are towards gods praising. The 2 days classical events creates a different environment at the bank of this tank which are enlightened with a beautiful stage near footsteps which are seen clean and the rhythms of classical instruments goes in the air for those few hours. The music, chants and mythological classical songs along with awareness also brings in tourists attractions who follows and likes the great classical Indian culture and comes specially to enjoy and study the same. We as a citizen don’t have to worry about all that is done, all the efforts and money it takes to keep such heritage in correct attractive conditions. We as a citizen just have to keep it clean just by respecting the ancient values, rare structures and monuments like Banganga and also by stopping others to create any non-sense around. See Also : Other tourist attractions near banganga are Hanging Garden, Kamla Nehru Park, Girgaum Chowpatty. Other must read is Parsi Tower of Silence at Malabar Hills.